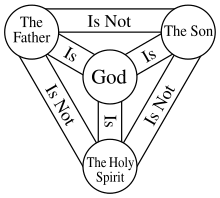 This is the first article in a series on the Christian doctrine of the Trinity. To see MRM’s website page on the Trinity to see other resources, please click here. Christians believe in the Trinity not because the term itself is given in some creedlike form in the text of Scripture. Instead, they believe in the Trinity because the Bible, taken in its completeness, accepted as a self-consistent revelation of God, teaches that there is one Being of God that is shared fully by three divine persons, the Father, the Son, and the Holy Spirit (p. 29). A true and accurate knowledge of the Trinity is a blessing in and of itself. Any revelation of God’s truth is an act of grace, of course, but the Trinity brings to us a blessing far beyond the worth normally assigned by believers today. Why? Because, upon reflection, we discover that the Trinity is the highest revelation God has made of himself to His people. It is the capstone, the summit, the brightest star in the firmament of divine truths. . . . God revealed this truth about himself most clearly, and most irrefutably, in the Incarnation itself, when Jesus Christ, the eternal Son of God, took on human flesh and walked among us. That one act revealed the Trinity to us in a way that no amount of verbal revelation could ever communicate. God has been pleased to reveal to us that He exists as Father, Son, and Holy Spirit. Since God feels it is important to know, we should likewise. And since God went through a great deal of trouble to make it clear to us, we should see the Trinity as a precious possession, at the very top of the many things God has revealed to us that we otherwise would have never known. (pp. 14-15). Whosoever will be saved, before all things it is necessary that he hold the catholic faith. Which faith except every one do keep whole and undefiled; without doubt he shall perish everlastingly. And the catholic faith is this: That we worship one God in Trinity, and Trinity in Unity; Neither confounding the Persons; nor dividing the Essence. For there is one Person of the Father; another of the Son; and another of the Holy Ghost. But the Godhead of the Father, of the Son, and of the Holy Ghost, is all one; the Glory equal, the Majesty coeternal. Such as the Father is; such is the Son; and such is the Holy Ghost. The Father uncreated; the Son uncreated; and the Holy Ghost uncreated. The Father unlimited; the Son unlimited; and the Holy Ghost unlimited. The Father eternal; the Son eternal; and the Holy Ghost eternal. And yet they are not three eternals; but one eternal. As also there are not three uncreated; nor three infinites, but one uncreated; and one infinite. So likewise the Father is Almighty; the Son Almighty; and the Holy Ghost Almighty. And yet they are not three Almighties; but one Almighty. So the Father is God; the Son is God; and the Holy Ghost is God. And yet they are not three Gods; but one God. So likewise the Father is Lord; the Son Lord; and the Holy Ghost Lord. And yet not three Lords; but one Lord. For like as we are compelled by the Christian verity; to acknowledge every Person by himself to be God and Lord; So are we forbidden by the catholic religion; to say, There are three Gods, or three Lords. The Father is made of none; neither created, nor begotten. The Son is of the Father alone; not made, nor created; but begotten. The Holy Ghost is of the Father and of the Son; neither made, nor created, nor begotten; but proceeding. So there is one Father, not three Fathers; one Son, not three Sons; one Holy Ghost, not three Holy Ghosts. And in this Trinity none is before, or after another; none is greater, or less than another. But the whole three Persons are coeternal, and coequal. So that in all things, as aforesaid; the Unity in Trinity, and the Trinity in Unity, is to be worshipped. He therefore that will be saved, let him thus think of the Trinity. There is only one God, as described in the Bible (for example, Deut. 6:4; Mark 12:29). The doctrine is considered so important that the last line (“He therefore that will be saved, let him thus think of the Trinity”) explains how a person should not be considered to be a Christian in the full sense of the word unless there is acceptance of the Trinity! We believe in one God, the Father Almighty, Maker of all things visible and invisible. And in one Lord Jesus Christ, the Son of God, begotten of the Father the only-begotten; that is, of the essence of the Father, god of God], Light of Light, very God of very God, begotten, not made, being of one substance with the Father; by whom all things were made [both in heaven and on earth]; who for us men, and for our salvation, came down and was incarnate and was made man; he suffered, and the third day he rose again, ascended into heaven; from thence he shall come to judge the quick and the dead. And in one Lord Jesus Christ, the only-begotten Son of God, begotten of the Father before all worlds (aeons), Light of Light, very God of very God, begotten not made, being of one substance with the Father, by whom all things were made; who for us men, and for our salvation, came down from heaven, and was incarnate by the Holy Ghost of the Virgin Mary, and was made man; he was crucified under Pontius Pilate, and suffered, and was buried, and the third day he rose again, according to the Scriptures, and ascended into heaven, and sitteth on the right hand of the Father; from thence he shall come again, with glory, to judge the quick and the dead; whose kingdom shall have no end. And in the Holy Ghost, the Lord and Giver of life, who proceedeth from the Father, who with the Father and the son together is worshipped and glorified, who spake by the prophets. In one holy Catholic and apostolic Church; we acknowledge one baptism for the remission of sins; we look for the resurrection of the dead, and the life of the world to come. Within the one Being that is God, there exists eternally three coequal and coeternal persons, namely, the Father, the Son, and the Holy Spirit. The Persons are coequal and coeternal (p. 28). …there is one God who is a being composed of three individuals, the Father, the Son, and the Holy Spirit, all of whom are to be worshipped as the same God, and who share in the same substance or essence (God in Three Persons, p. 24). In the nature (or substance) of the one true God, there are three distinct persons, the Father, the Son, and the Holy Spirit. Here is the primary idea of “tri-unity,” a “Trinity in unity,” three persons sharing equally in a single substance of deity. Biblical support for this teaching is provided in Is there Biblical support for the Trinity? and Does the Bible really say that Jesus is God?